The Victoria Cross was introduced in 1856 by Queen Victoria. It was awarded for “… most conspicuous bravery, or some daring or pre-eminent act of valour or self-sacrifice, or extreme devotion to duty in the presence of the enemy.” Since its inception the medal has been awarded 1,356 times. 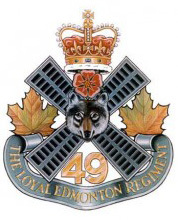 Two members of the 49th Battalion, perpetuated by The Loyal Edmonton Regiment, have received this highest honour: Private John Chipman Kerr, and Private Cecil John Kinross.